>Awesome. "No, that's a lady breastfeeding. Don't stare." Great post! The perfect distraction as my video project renders at 1:30 in the AM. Thanks! >I love visiting places like that, but not with my kids so much. Actually down town where I live isn't to dissimilar. Sure we don't have some of the worst problems exposed (pun intended) publicly, but we do have all the same kind of people hanging out on Main street. I like to go down there and hang out with them. I need to clear more time in my schedule for that. >You know, I just read what NtG wrote, and I realize that I am so wrong! Those are exactly the neighborhoods where a Christian needs to reach out, not avoid in horror. Thanks Nick! >I love Mrs. Tony C.
Great post…lots to 'think' about! >This is exactly why I avoid cities at all costs. That was a great post, Tony. >Thanks Katdish for letting me be your guest blogger. You have an awesome blog, and I feel honored to be included. >OK, this was brilliant, as all of Tony's posts are. 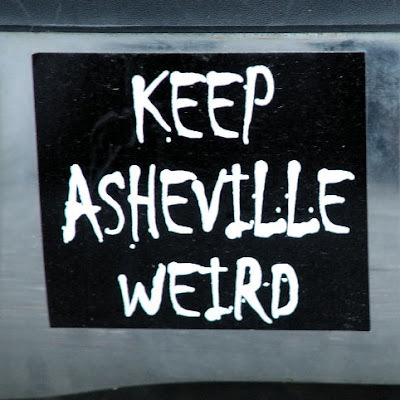 But what irks my stuff is that Asheville is TOTALLY ripping off on Austin. "Keep Austin Weird" as been their slogan for ages. And Austin is way better than Asheville. I don't even feel badly for saying that, especially since A'ville is less than 2 hours from me. Yeah, I picked that one thing to harp on in the comments. That's ok. Tony knows me…and loves me…and his wife is hard rockin'.